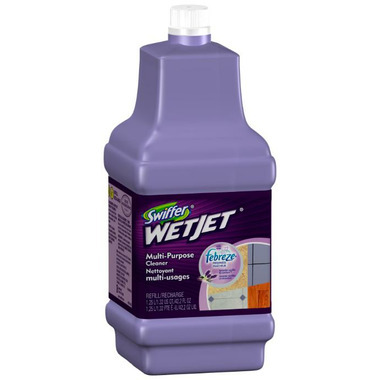 Swiffer® WetJet® gives you a great clean on virtually any floor in up to half the time. With a dual-nozzle sprayer and a strong-grip pole, this all-in-one mopping system breaks up and dissolves tough messes better than a mop and bucket. Plus its cleaning solution is designed to penetrate layers of dirt, absorb dirt and grime into the WetJet pad, and lock it away for good. You can scrub really tough, dried-on spots or messes with a large scrubby strip to get you a clean you can feel. Very handy to quickly wipe, & gloss up the floors, & leaves a lasting freshness throughout the whole house. Works great on multisurface floors. Lasts a long time, can swiffer a good amount before it runs out. Pleasant scent and highly recommended. The product goes a long way! Mine always lasts for a while, as I use it once every couple of weeks in my small apartment. For larger homes and those that need more frequent mopping, this may not be economical. Pleasant scent!